I am Lauri Tervonen, a.k.a. Möllikkä [møl:ik:æ]. I often write my alias as Mollikka as an act of kindness towards all the nice people and computers outside Finland. Some of my interests include automated testing, plane tilings, fractals, and procedural content. I'm also into game design, poetry, and nature photography. You can contact me via e-mail on terv@lau.rip or on Twitter by shouting at @Mollikka. You can also ask me anything or read some old answers in my Github AMA. I also have a number of social media accounts on the Internet. Each of the following icons represents one of them. I'm a student in the Computer Science and Engineering programme in Aalto University. I did my Bachelor's thesis in Computer Science at Aalto University in 2015. I analyzed Cordial Minuet as a zero-sum game and looked for strategies that maximize the winnings in a simplified version of the game. I also found that the choice of game board might have a some effect on expected payoff of the players, which brings an element of luck to the official implementation. My advisor on the thesis was Louis Theran. In 2014-2016 I taught the fall orientation course for new students at Aalto University. In 2013-2015 I designed exercises and taught computer class sessions for CSE-A1130, an Aalto University applied programming course aimed at first year students. In May 2017, I made a landing page for the music band Oceill. Breeding Simulator 2016 is a fully configurable genome calculation tool for an adoptable/breeding game community. This was made-to-order and I got rewarded for it. Temporal Paradox is a game prototype I made a long time ago, in junior high school, I think. I think it's a quite entertaining puzzle game with a time travel mechanic. The game is provided in Win32 executable form. I used to spend all my time creating maps for Valve games in Valve Hammer Editor and I still go back now and then. Here are some of my favorite creations. 3D printing has allowed many new people to try designing everyday objects. One of those people is me. Check out the one and only Bee-approved holder for your office pens and paper knives (2016) It has almost 10 000 downloads as of November 2018. Printable Nintendo cart stands (2016) hold all your favorite game carts on display, ready to be played. The model is parametric and easy to customize. Check it out! 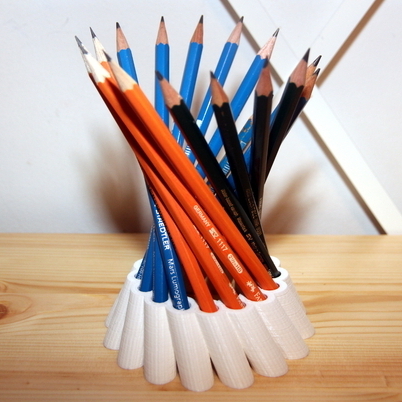 Hyperboloid pen holder (2016) holds 16 pencils nicely on an office desk. Hyperboloids are mathematical objects classified as ruled surfaces. This means that for each point on the surface, there's a straight line (or in this case, a pencil) that goes through that point. I look at art with my own personal definition: a deliberate product of human work that lacks direct external purpose. (May not be useful when researching something like Avant-Garde.) I find it beautiful that people put tremendous effort into something useless. 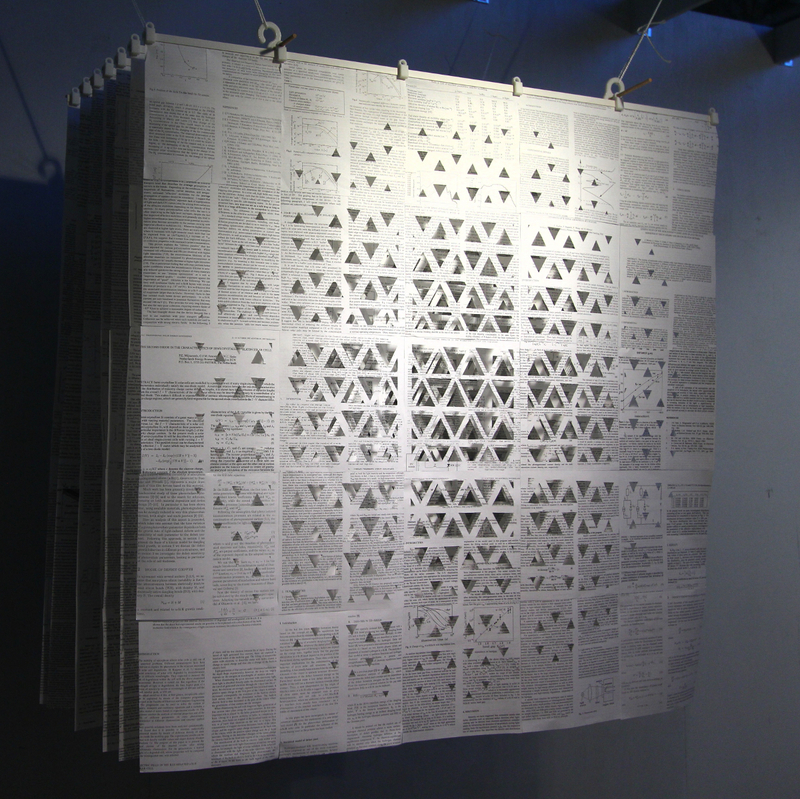 Ydin (2015) is an upcycled paper sculpture. I cut the pages of some photoelectric conference proceedings with a paper knife and arranged them into seven sheets of roughly 80cm * 80cm. 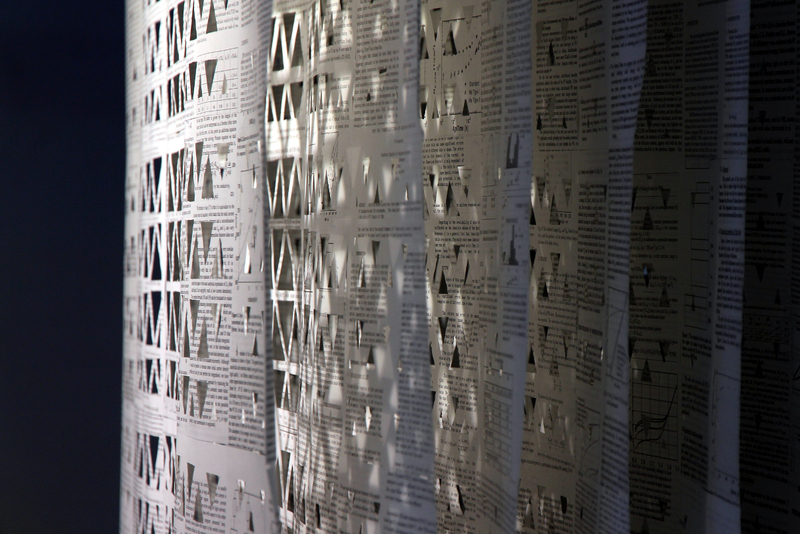 Ydin was on display at Habitare 2015 in Messukeskus, Helsinki as part of a student exhibition called Edited. Edited featured upcycled book art from 7 Aalto University students. Ropina (2015) is a set of textile patterns I designed. 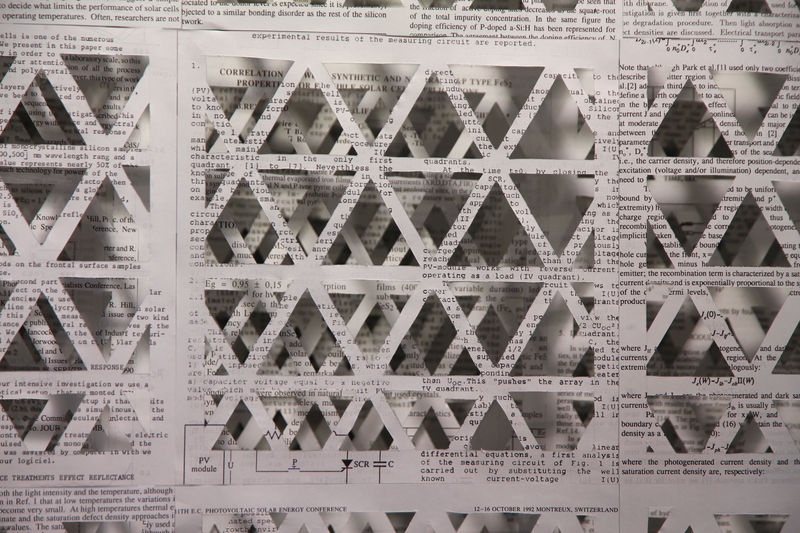 One variant was on display at Crystal Flowers in Halls of Mirrors 2015 exhibition in Otaniemi. 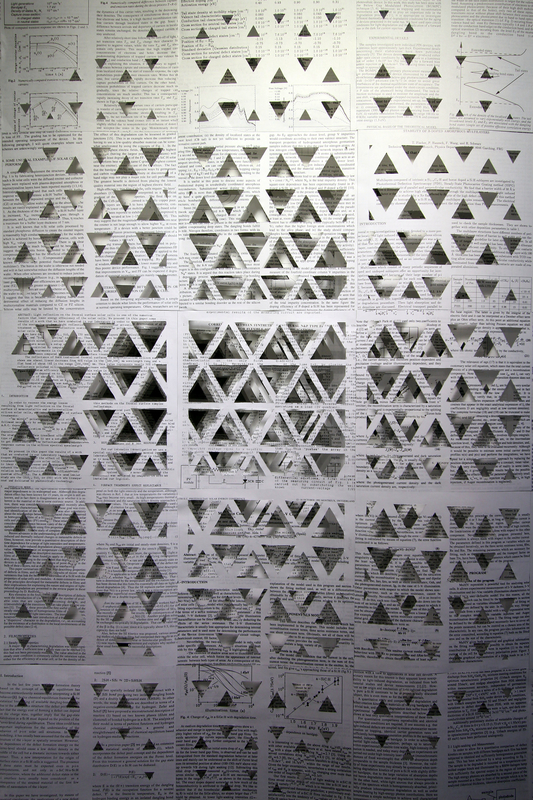 In the exhibition it was featured as part of a larger collection of repeating pattern surfaces, and the sign said 'Giant 2'. The work was on display in Aalto University, Otakaari 1, right outside lecture hall B.
Mutating Surface (2015) is a student group collaboration that was on display at Crystal Flowers in Halls of Mirrors exhibition in Otaniemi. It's a magnetic gearwork with rotating mirror plates. I worked on the concept, building, and Arduino programming. I designed a set of decorative 3D-printed plastic vases, Life (2013). Each vase is defined by a mathematical function r = f(α,h). There are six vases in the series: Lungs, Heart, Body, Toxin, Spirit, Mind. Photography is like a hobby to me in that it is a recreational activity I regularly do on my free time. Typically I take a day trip to a local forest or a zoo and snap two hundred photos. On a good day, five of them are presentable. You might want to check out my Flickr account for more.